Fox News must like the health care reform package put forth by Sen Max Baucus (D-MT) because they just claimed him as a Republican… They’re known for doing the opposite for Republicans who get caught doing stupid things, i.e. labeling Gov. Mark Sanford (R-SC) as a Democrat when he admitted to having an affair. 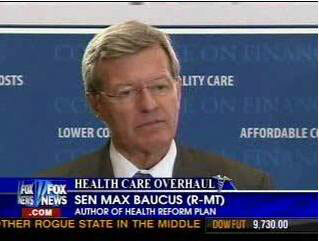 Sen. Baucus is Republican Lite. I’ll give Faux a break on this one.